Insulated duct may be a little pricey, but it will allow for conditioned air to pass through your system more efficiently. Within an HVAC system, the ducting transports controlled air throughout the house. You can most commonly find insulated duct in diameters of 6 inches to 18 inches, but larger diameters can also be found. 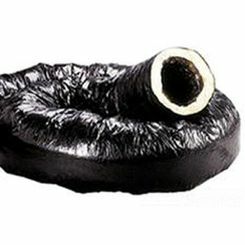 This type of duct is most commonly made of a coiled metal (usually aluminum) wire wrapped in plastic to create a tube or hose appearance. This allows you to shape or flex the pipe in the shape and direction that is needed. The insulation is then wrapped around the pipe in different R-values (Unit Thermal Resistance). The number of sizes and shapes of HVAC pipe options almost seems endless. Standard flexible duct is found elsewhere. It acts as a sound barrier for the noise that your central air system creates. Some models contain a UV-Protected pipe, which is great for mobile home applications. Vapor Barriers - Extra plastic covering that protects the insulation from water damage. 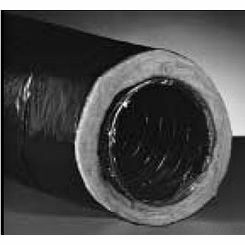 Quietflex uses Johns Manville Formaldehyde-free fiberglass insulation with their flex duct. Quietflex - Quietflex began in 1976 in a home garage of all places. An HVAC contractor wanted to provide quality flexible ductwork, especially with fiberglass applications. Since their modest beginning, they have grown to have four large facilities in just fewer than 40 years. They are completely dedicated to their customers, when it comes to high-quality insulated flexible duct. Hart & Cooley - insulated duct helped put them on the map and they have been a leader in the HVAC industry for over 100 years. Not only do they manufacture insulated flex pipe, but they also produce chimney liners, diffusers and registers, type-b gas vent, and grilles all for different types of HVAC applications. They have a strong reputation in the HVAC world, and they make excellence a top priority in all that they do. NOTE: Here at PlumbersStock, we are dedicated to providing quality products for both the Contractor and the Do-it-yourselfer. 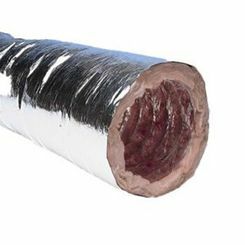 We currently have only Quietflex insulated ducting in stock, but for the special order hard to find products that you need we work with Hart & Cooley. Please contact us and we can help you get that hard to find duct piece to complete your project. We want to help you complete the job no matter if you are a contractor or Do-it-yourselfer. Here at PlumbersStock, we carry the best products from top manufacturers in their fields at wholesale prices. There is nowhere else on the web where you can find deals like these on high-quality plumbing and HVAC products. If you have any questions, contact our professional staff and we can help you get the insulated air duct you need to complete the job.